1) The position on the canvas and the size of the table symbol for every table that has been defined for this LAYOUT as well as the content of the GRID. This is used (of course) for populating the tab when opening a saved Query Builder XML file. When the Query Builder tab is selected the 'File' menu will by default handle Query Builder XML files for open, save etc. 2) When opening a Query Builder XML file SQLyog will verify that the file and the tables are 'in sync' (ie. the file does not reference objects that do not exist). Some other client or session may have changed (DROPPED or ALTERED) the table(s), since the file was last saved. In case they are found to be 'out of sync' the program will populate the canvas and the GRID with those objects referenced in the Query Builder XML file that exist in the database with a warning. Note that the resulting query may then be incomplete. 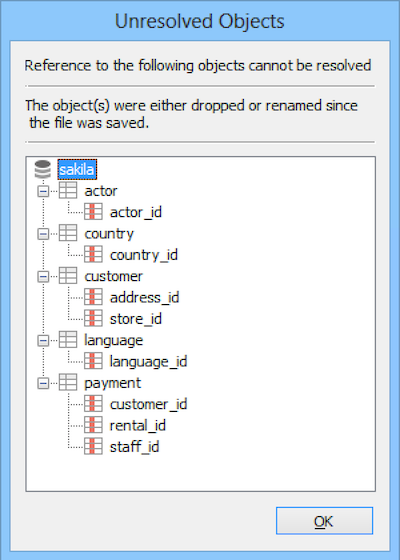 Note: This feature is available in SQLyog Enterprise and Ultimate.